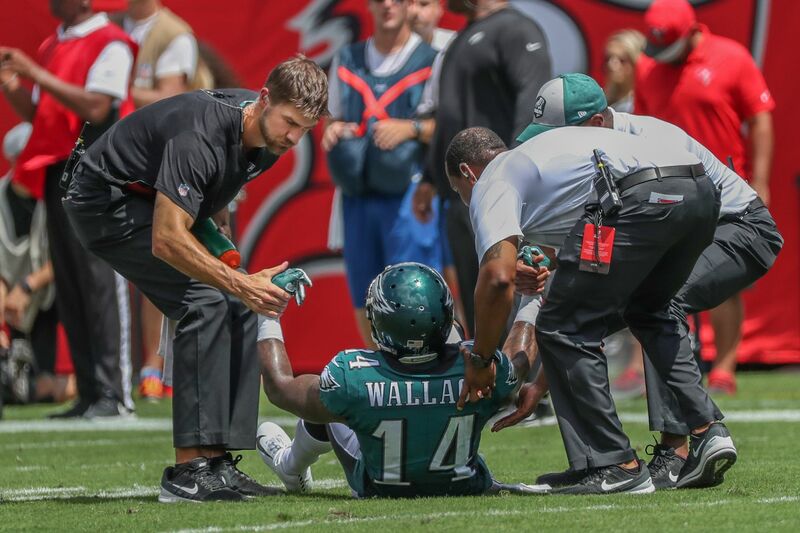 Mike Wallace is the latest Eagles wide receiver who will miss time with an injury after he suffered a fractured right fibula in the first quarter of the Eagles' loss to the Tampa Bay Buccaneers on Sunday. Head coach Doug Pederson said Wallace will miss a few weeks, but said the team does not yet plan to put Wallace on injured reserve. That means the Eagles are hoping Wallace will return this season. "We're still going to evaluate," Pederson said. "He's got a few more tests in the next couple of days, but we know exactly [what it is]. It's a fracture and that's going to be a couple of weeks." Alshon Jeffery remains "week to week" while recovering from rotator cuff surgery in the offseason. He still has not been cleared for contact. Both Jeffery and Wallace count against the Eagles' 53-man roster. The Eagles already put Mack Hollins on injured reserve, so they're down three of their projected top four receivers this season: Jeffery, Wallace, and Hollins. Their healthy receivers are Nelson Agholor, Shelton Gibson, Kamar Aiken, and DeAndre Carter. Pederson sounded interested in adding a veteran receiver from outside the organization to upgrade the roster. "It goes back to us always and constantly looking outside to help bring in some guys," Pederson said. "If you just asked me, a veteran player would be a lot easier to work with than a young rookie player to get them caught up, plus a guy that's had game experience. Definitely going to have to rely on the tight ends more, going to have to rely on the running game a little bit more and kind of lean that direction until we can figure this out." One high-profile wide receiver is off the market after the New England Patriots acquired Cleveland Browns wide receiver Josh Gordon for a fifth-round pick on Monday.